Yosemite Valley is a freak of nature. It's only seven miles long and less than a mile wide, but it ranks higher in scenery per square foot than perhaps anywhere else in the world. Because it was formed by glaciation, the valley walls are sheer and high, leading to world-famous cliffs: El Capitan, a mountain-climbing mecca, rises more than 3,000 feet (900 meters) virtually straight up from the Yosemite Valley floor, and Half Dome looms 4,800 feet (1,600) meters above. It's also heaven for waterfalls. Why does central California fill up with storm clouds in the winter? Because adrenaline-junkie water droplets from all over the world are jostling to make it into the Sierra snowpack, just so they can spend twenty unforgettable seconds plunging over Yosemite or Bridalveil Falls. Of course, these thrill-seeking waters are exhibitionists, too. They know that when they leap into the abyss, people will be watching them. Lots of people. 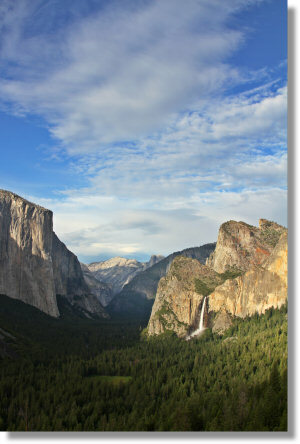 This is Yosemite Valley's curse - it's a popular place. The crowds can be trying on summer weekends, and particularly on holiday weekends. If your schedule allows it, visit the valley on weekdays and spend your weekends exploring other parts of Yosemite - there's no shortage of spectacular stuff in the rest of the park. 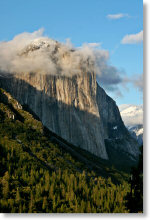 Winter is also a great time to visit Yosemite Valley. The high country roads close in the winter, but the valley stays open and is much less crowded than during the summer. Although Yosemite Valley is most famous for the walls that surround it, the valley floor itself is also uncommonly pretty. The Merced River wanders through it, and meadows appear frequently along its length. Deer and coyotes	are common sights, and bear are known to be about after dark. Yosemite Valley also has the most extensive network of bike paths anywhere in the park, and although you can drive or take free shuttle buses to much of the valley, bicycles are probably the most enjoyable way to get around here. If you didn't bring your own bike, you can rent one at Curry Village, which lies near the east end of Yosemite Valley. * For hikes that have more than one possible route, this table lists distance and elevation for the shortest route. Or the longest one. Whatever seemed most interesting at the moment. Listed distances for most hikes are round trip; click on hike names for more details. There are four non-camping options in Yosemite Valley: the $400-a-night Ahwahnee Hotel, the Yosemite Lodge, the cabins and tent cabins at Curry Village, and the quirky tent/house hybrids at the Housekeeping Camp. Good luck getting into any of them in the summer without a reservation well in advance, though. They fill up fast. El Portal, outside the park but still just a few miles from Yosemite Valley, has two large motels. Advance reservations are recommended for summertime visits there, too. If you didn't plan far enough ahead, you'll have to stay in one of the small towns outside the park; see the Yosemite Lodging guide for more details. 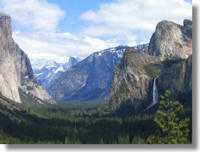 The Upper Pines, Lower Pines, and North Pines campgrounds are all in a bunch at the eastern end of Yosemite Valley, near Curry Village and the Mist Trail, Half Dome, and Mirror Lake trailheads. They contain 379 campsites between them. You'll need reservations for them in the summer, and you'll usually need to get them months ahead. Campground #4, on the north side of the valley where the Upper Yosemite Falls trail starts its ascent, has 35 walk-in (no RV's) first-come, first-serve campsites. It's generally recommended to arrive sometime between 7 a.m. and 9 a.m. to get a spot here. In Yosemite Village, you'll find the Village Store, your largest source of groceries in the valley; the Village Grill, a walk-up burger joint; and Degnan's, which includes a deli and pizza parlor. Curry Village has the Mountain Shop, a smaller version of the Yosemite Village store; a tacqueria; and a pizza parlor. Like Yosemite Village, the restaurants in Curry Village are passable but not exceptional. 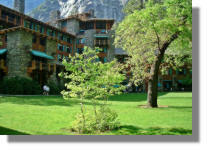 The Yosemite Lodge has a gifts/groceries shop, a bar, and a cafeteria. The Ahwahnee Hotel has a restaurant/bar with patio seating, but it's most famous for the beautiful Ahwahnee Dining Room, which has 34-foot beamed ceilings, gourmet prices, and a dress code for dinner. There's no gas available in Yosemite Valley. Your nearest available options are at El Portal (roughly 11 miles/18km), Crane Flat (14 miles/22 km), or Wawona (22 miles/35 km). Yosemite gets five million visitors annually, and it's estimated that six million of those will be in Yosemite Valley on the weekend you're there this summer. Traffic can get severely backed up on summer weekends, particularly in the eastern end of the valley. Once traffic gets heavy, the park service will reserve lanes for official park vehicles (ambulances, shuttle buses, and the like), and though you can see why they'd want to do that, it does tend to compound traffic issues. It's generally recommended that if you're visiting the valley on a summer weekend (Memorial Day through Labor Day, though traffic jams can occur as early as April), you arrive before 9 am or after 4 pm to avoid getting stuck in traffic, and once you're in the valley, find a parking spot ASAP and then either walk or take the free shuttle buses to get around in the valley. The free east-valley shuttle runs year round from 7 am to 10 pm and covers everything from Yosemite Falls east (including Yosemite Village, Curry Village, the Ahwahnee Hotel, and the Mist Trail trailhead). The west-valley El Capitan shuttle (also free) runs 9 am to 5 pm, mid June through early October, and covers from Yosemite Falls west to the El Capitan and Cathedral Beach picnic areas, including the 4-Mile Trail trailhead (see this PDF map of the shuttle routes). Neither shuttle gets as far west as Bridalveil Fall or the Tunnel View - somewhat inexplicably given that these are very popular places and the park service wants to reduce auto traffic in the valley - so you'll have to drive to get to those; consider saving them for when you're on your way into or out of the valley. The park service has more information on traffic and parking in general.